Will Delhi's BRT be given a chance to prove itself? 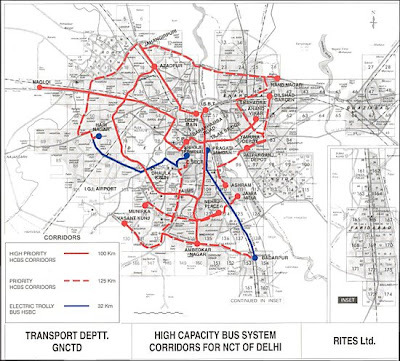 Bad press and teething problems seem to be putting Delhi's ambitious BRT plans in danger. Delhi's BRT pilot phase has entered a trial period since Sunday. The first 5.6 km is due to start formally on 1 May. Unfortunately press coverage of the project continues to be extremely hostile. Reading some of the articles on this in the Indian media one could be forgiven for thinking that Delhi's entire congestion problem is caused by 5.6 km of busway. All this looks worrying for Delhi's BRT. If politicians cave in and abandon the project now it would be a huge setback for public transport in India. A hasty, low-quality start in Pune didn't help either. Ahmedabad's BRT which is under construction is aiming at a much higher standard of BRT implementation than any other Indian proposal so far. It has benefited from technical assistance from ITDP. But I fear even that project might be harmed by any implosion of Delhi's high-profile (albeit lower standard) effort. It would be a great shame if a lack of patience to sort things out in Delhi turns BRT into a dirty word in India. Few of Delhi's media opinion leaders seem to be willing to give it any chance to prove itself. From negativity to constructive efforts to improve? As I have mentioned before, Jakarta's busway (a closed system, unlike Delhi's open one) has also seen its share of controversy. But the debate there seems to be gradually shifting. Instead of "let's get rid of this catastrophe" the main question seems increasingly to be "How can we make this work better?" Progress is slow but that seems like progress to me and a great sign for the future of Jakarta's public transport system, which needs all the help it can get. Meanwhile, BRT in China is expanding with systems of various levels of ambition that are succeeding in both very large cities and smaller ones. New corridors in Beijing will be on show during the Olympics. What does successful BRT look like? Can Delhi's BRT be turned into a success? I am not sure. I don't know enough of the local details. But having come this far, surely it needs a sporting chance. I hope that this project gets pushed through. Our CM is very courageous and can push things through. But, unfortunately she has not done enough to sell the idea to people. The press was so bad and asking for it to be scrapped even before it was operational. But, we need somebody to sell hope, hope of better public transport and a pedestrian friendly city. I believe its a great idea to have a dedicated transportation system like this.THis has proved itself in various countries, the only drawback is indian press media is finding out faults in the system which is still in the initial stages of implementation instead of praising the government and educating the general public about the change.I hope that purblic will accept the change positively for the self and city's betterment. I have to traverse Delhi's BRT corridor frequently to get to and from Greater Kailash II. It is a continuing nightmare and bottleneck on all days of the week and at all hours (except on a Sunday morning when traffic is minimal). There is no lane discipline, and no one to enforce any discipline. The brigade of BRT TRIGs congregate in the shade and are busy chatting amongst themselves while motorcycles, autorickshaws and even cars jump on to the cycle paths to escape the traffic pile-up, particularly at the Chirag Delhi crossing. The left turn is invariably blocked by traffic waiting to go straight, adding to the pile-ups. Buses whizz past at more than the speed limit. On the way back, the right turn from the Outer Ring Road to the corridor takes a minimum of 15 minutes because of the haphazard pile-up of traffic. The only way this could have worked was if an underpass had been made at the Chirag Delhi crossing for through traffic, before the bus corridor was created. The only discipline that has been introduced is at the pedestrian crossings, where a combination of signals and TRIGs does get the traffic to stop. It may have been a great idea on paper, but its implementation has been flawed, and no one took into account the volume and diversity of traffic squeezed into the two lanes after providing the bus lane. Unless there is a concerted effort to discipline drivers, this will be a continuing nightmare.